4011 series two and three display stopwatch clocks are a unique range of large digital stopwatches with an independent time-of-day display all housed in a single case. 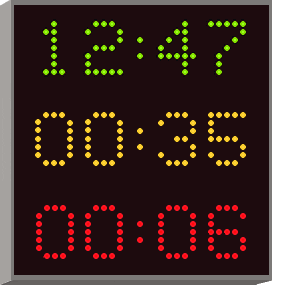 Bright, ultra reliable time and day display with choice of blue, green, red or yellow characters. NE versions are 10/100Base-t Ethernet NTP enabled for simple low cost installation and control via your existing Ethernet network. 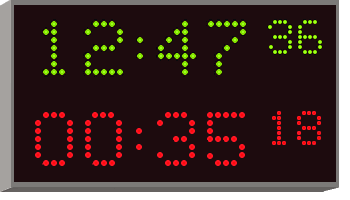 Network operation allows multiple stopwatch slave display controlled by a single switch panel. 110-230V AC, 12 or 24V DC power supply options with PoE (Power over Ethernet) option for NE versions. 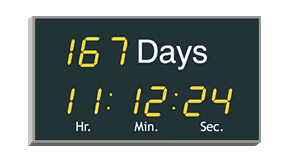 IR handset for time-setting and count-down configuration. E and NE versions will operate stand-alone or as a slave or secondary clock controlled via any of numerous time signals. 305 x 180 x 58mm 12" x 7.1" x 2.3"
305 x 270 x 58mm 12" x 10.6 x 2.3"
240 x 180 x 58mm 9.4" x 7.1" x 2.3"